Reminder: National Drug Take-Back Day is tomorrow, Saturday, April 28, 2018. The Kingsport Police Department and other community partners will be conducting a local drug take-back event from 10:00 AM until 2:00 PM in the parking lot of the V.O. Dobbins Complex, located at 301 Louis Street. Please consider cleaning out your medicine cabinet between now and then and bringing your expired or leftover medications to us for safe disposal. 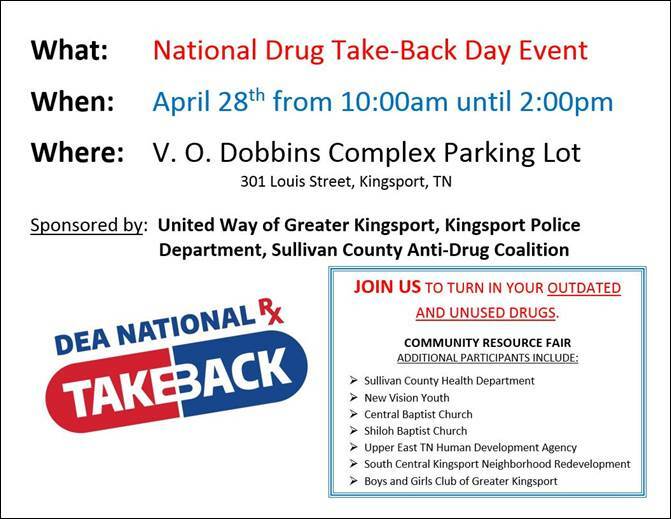 On Saturday, April 28, 2018 from 10:00 AM until 2:00 PM, the Kingsport Police Department will be participating in a community drug take-back event. This event will take place in the parking lot of the V.O. Dobbins Complex, located at 301 Louis Street, in the Riverview neighborhood of Kingsport. This event is sponsored by the United Way of Greater Kingsport, the Kingsport Police Department, and the Sullivan County Anti-Drug Coalition. The event will also include a Community Resource Fair with participation from the Sullivan County Health Department, New Vision Youth, Central Baptist Church, Shiloh Baptist Church, Upper East Tennessee Human Development, South Central Kingsport Neighborhood Redevelopment, and the Boys and Girls Club of Greater Kingsport. Between now and Saturday, April 28th, all area residents are encouraged to go through their medicine cabinets and inventory their medications. This community drug take-back event is open to the public and is a prime opportunity and the preferred method to safely dispose of any medications that are no longer needed. While the DEA does recognize these two annual days, at the Kingsport Police Department, we like to think of every day as Take-Back Day. K.P.D. has been participating in drug take-back initiatives since 2010 and installed a permanent drug collection box in the lobby of the Kingsport Justice Center, located at 200 Shelby Street in Downtown Kingsport, in 2012. Our box is accessible 24 hours-a-day, 7 days-a-week, 365 days-a-year. To date, K.P.D. has been able to safely incinerate over 10,000 pounds (5 tons) of leftover, unwanted, or expired medications. The goals of this program are to keep drugs off the street, prevent overdoses and accidental poisonings, and avoid environmental contamination. Drugs that can be accepted include prescription, over the counter (OTC), vitamins, herbals, supplements, and veterinary medications. Items that are preferably not accepted through this program include needles or sharps, biohazard materials, and illegal drugs.